A trade is comprised of the WHERE and the WHEN. Context is king. 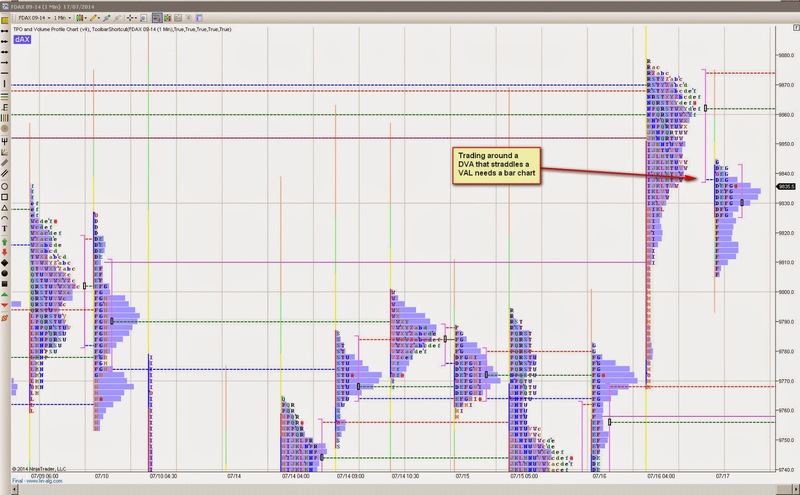 I can put on a perfect picture but if I ignore the context - Market Profile - then the perfection means nothing. This context is the difference in performance between a discretionary trade and an automated algo trade. The chart below is a perfect example. The developing value area (DVA) is straddling the overlapping Value Area Low (VAL). Will it go into the previous VA or will price develop value lower? The bar chart tells that story as it reveals itself. Looking at the bar chart, the picture is clear. Price is in a down trend and rallies must be sold. 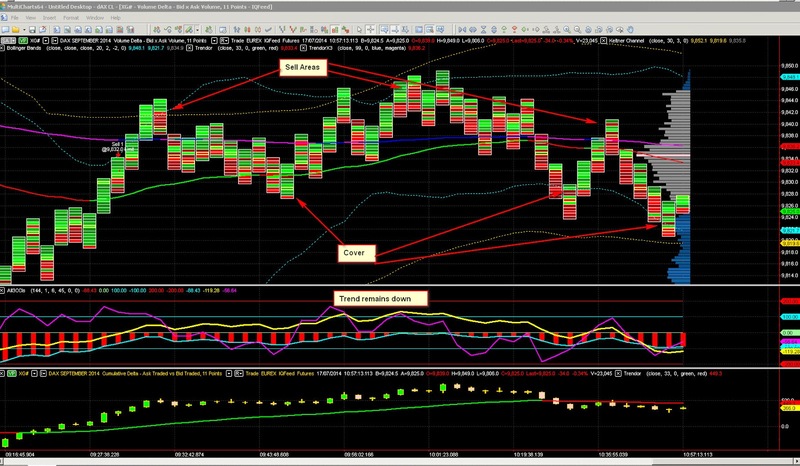 Short term scalping traders will cover and reshort. Slightly longer term traders will stay short and add to shorts until support is reached or until the market tells them they are wrong. Each trader has a so called "style" which determines the rhythm of their trading and the types of trades they carry out. Was there an expectation for it run down the zipper to 9770? How is this MP different than your typical zipper trade? I had a sell stop that was filled with slippage as the zipper made double TPOs in M period. It was very fast. That was a fairly typical zipper trade. Sounds like it was a good day for you! Was sell stop just below yesterday's I period? What were the targets- do you usually look for the entire zipper to fill, or do u scale out at support/res? Would love to see your ES chart for 7/23 and 7/24. Would also love to hear more about your gap trades. Gap trades have changed with QE. There's additional criteria needed to maintain a high win rate that I am covering in the ebook.